More and more AFM is becoming the tool of choice for non-destructive surface measurements with molecular and sub-molecular resolution. However, the resolution and accuracy of the technique is limited by the size and shape of the tip. In order to increase resolution, it is necessary to both decrease the tip size and the tip-sample interaction force. The development of the line of Hi’Res probes has overcome these obstacles and made higher resolution, sub-nanometer imaging possible. The Hi’Res probes allow for more accurate measurement of extremely narrow features such as pores, trenches, and sharp edges, along with accurate measurement of sub-nanometer surface roughness. In addition, these probes are also good for imaging soft, fragile and near-liquid samples as the tip-sample attraction force is significantly reduced due to the unsurpassed subnanometer tip radius. Conventional Silicon probe in Tapping mode. 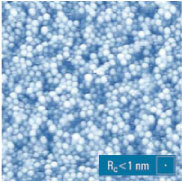 Tip radius Rtip ~ 10 nm. Hi’Res probe in Tapping mode. Individual molecules are resolved. Tip radius Rtip ~ 1 nm. High-resolution probes are recommended for scanning small areas below 250 nm at 512 sampling points. Lateral resolution below 1 nm is attainable. Hi’Res-C probes have a diamond-like spike on the apex of the silicon tip. The sharpness of the spike determines the resolution. Lateral resolution below 1 nm. For scanning small areas below 250 nm at 512 points.